Please see below for information about Bishop Montgomery's 2019 commencement exercises. If you have additional questions about the ceremony, please contact Ms. Dione Dierks at ddierks@bmhs-la.org. How many tickets does each senior receive? Each graduating senior will receive NINE graduation tickets for bleacher seating. Valedictorians and salutatorians each receive an additional seven tickets. ALL guests attending Bishop Montgomery’s graduation ceremony, REGARDLESS OF AGE, must present a ticket at the gate for admission. No exceptions. When do the seniors receive their graduation tickets? Graduation tickets will be distributed at the graduation practice on May 21. Lost tickets will not be replaced. Where can I get extra tickets? Extra tickets must be obtained from other graduates who do not need them. School Offices or school personnel do not have additional tickets – Please do not contact Bishop Montgomery. When do the seniors receive their caps and gowns? Graduation practice will be on Tuesday, May 21 at 7:15 a.m. and is mandatory. Seniors should be in full uniform and report to assigned practice rooms in the third building by this time. Students who choose not to attend this practice may not receive their graduation tickets nor will they be permitted to participate in the graduation ceremony. When do the seniors receive their announcements (and other pre-ordered items from Jostens)? Graduation announcements (and other pre-ordered items from Jostens) were distributed to seniors in March. All seniors were invited to the lunch time pick-up location to get their 10 free announcements, as well as any graduation items they may have were ordered in the fall. Can I get extra announcements? Additional announcements (1 pack of ten = $20) are currently available in the Main Office. What are the options available for disabled or elderly guests who cannot sit in the bleachers? A canopy tent with seating will be available in the north end zone of the field (side view of ceremony) for guests who are in wheelchairs, who may have difficulty climbing stairs, or who need shade during the ceremony. Faculty members will be available at the tent to assist guests before, after, and during the ceremony. To obtain a ticket for tent seating, seniors may exchange one or more bleacher tickets in the front office after graduation practice on May 21. Seating will be limited under the canopy and we request that only guests requiring this special seating utilize this service. Tickets will be available for exchange on a first-come, first-served basis. What time do the bleachers/field open for seating? The bleachers and field will open for seating at 10:00am. What time do seniors need to be on campus on graduation day? All seniors need to report to their designated practice rooms no later than 10:00am with their cap and gown. The ceremony will begin promptly at 11:00a.m. The graduation ceremony should last approximately 1 ½ hours. Handicapped parking spaces will be available on a first-come, first served basis at the rear of the school by the gymnasium. Only cars displaying a DMV-issued handicapped placard will be permitted to park in these spaces. What if I arrive and all handicapped parking spaces are full? There will be a drop-off location for disabled/elderly guests at the rear of the school, near the ceremony entrance. Vehicles will be allowed to drive to the rear of the school to drop off disabled/elderly guests before returning to the front of the school / surrounding side streets to park. Bench seating and restrooms will be available for our disabled/elderly guests if they need to wait for the rest of their party to return from parking the vehicle. We request that at least one family member wait with the elderly/disabled guest while the other family member(s) park. BMHS faculty members will also be available in the drop-off area for assistance. What is the dress code for seniors for the graduation ceremony? The dress code for graduation is outlined in the Parent/Student Handbook. Seniors may NOT make alterations to their caps and gowns nor wear anything over or on the cap and gown, with exception of school-issued honor cords, pins and/or medals. 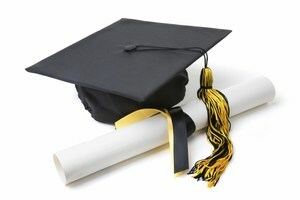 Students who choose not to comply with this policy will be prohibited from participating in the graduation ceremony. Tennis shoes are neither appropriate nor acceptable for the occasion. Also, because the ceremony will take place on the football field, and because the graduates will use stairs when crossing the stage to receive their diplomas, graduates should choose appropriate shoes for the ceremony. For safety reasons, ladies are urged not to wear stiletto-style heels to the ceremony. Please note that it is often very windy on the field during the ceremony. It is recommended that the graduates use bobby pins to ensure their caps remain in place. Seniors who choose not to adhere to the graduation dress code guidelines may not be permitted to participate in the graduation ceremony. How do the seniors pick up their diplomas after the ceremony? At the conclusion of the ceremony, seniors must report immediately back to their rooms to obtain their diplomas and pick up any belongings left behind. Seniors may keep their caps and gowns. Any diplomas or other items not picked up within 10 minutes after the ceremony ends will be taken to the front office and made available beginning Tuesday, May 28.